The treatment should continue and we need to raise this amount in a months time. I request each and everyone to help Harsha recover as soon as possible and come back home healthy. Harsha is doing amazing. Doctors are satisfied with his recovery. Harsha's Parents have thanked again and again for all the support flowed in the time of need and they are grateful to each and everyone of you. Harsha is on the path to recovery and it'll take time for him to get back to normal. He'll be visiting doctor at Apollo Chennai for regular check ups for the next few months until the doctors be very much sure about his complete recovery. 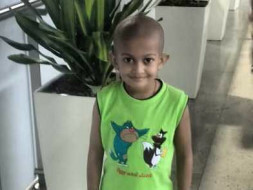 Harsha and his family have asked me to thank each and everyone of you for the support y'all have extended. Really appreciate it. Thank you so much and God bless you all with good health and happiness. 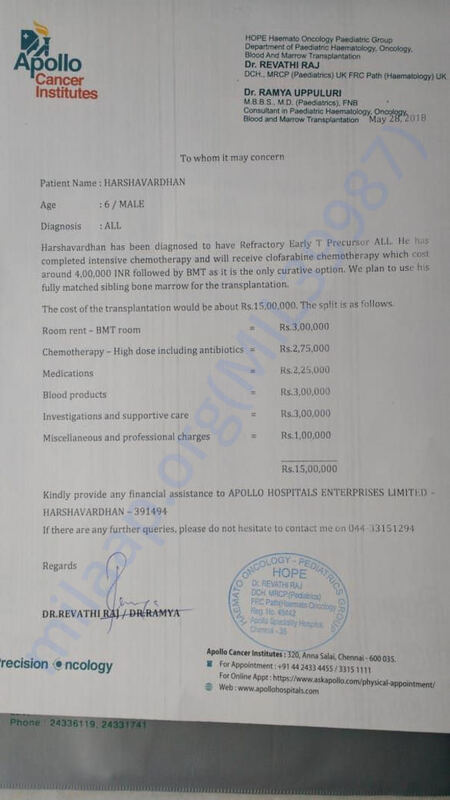 Harsha's Bone marrow Transplantation has been completed successfully and he is under observation now. The platelets count is low and will gradually increase as each day pass by. Doctors will be observing him everyday to see the growth in his platelet count. We thank every well wisher who've supported for Harsha's treatment in every possible way. Please keep Harsha in your prayers for his speedy recovery.